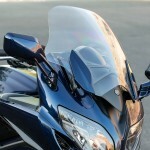 Yamaha released the first FJR1300 as a 2003 model and graced it with its most recent major update in 2013. 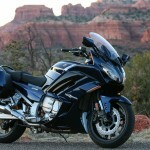 A year after that overhaul, the FJR1300ES, with its cool electronically adjustable suspension was announced. 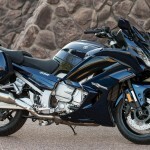 For 2016 Yamaha has continued its process of refining this popular, established platform with some upgrades to modernize the FJR and address some owner requests. Other than the 2016 Cobalt Blue color, the only visual alteration apparent on the new model is in the headlights, a change so subtle that only the sharpest-eyed – and cognizant – observers would notice. Some may ask, why bother with just making small changes rather than a major reboot of the platform? 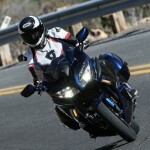 The answer is simple, Yamaha has a motorcycle that works quite well in its market, one good enough to claim runner up for Best Sport-Touring Motorcycle of 2014, win our 2013 Sport-Touring Shootout, take second in our 2014 Sport-Touring Shootout against a touring bike in S-T clothes, costing $10,000 more, and notch another second in our second sport-touring shootout of 2014 while operating at a $4,000 MSRP deficit. 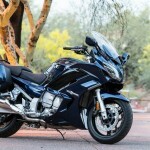 In fact, the case seems pretty clear that, while riders and motojournalists alike would love a major revamping of the FJR1300, the prudent approach in these still questionable economic times would be to address issues and polish up appearance. So, ahead of the inevitable cries in the comments section, a reminder: the FJR1300ES and FJR1300A were already pretty dang fun motorcycles. 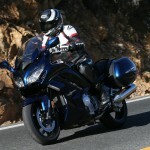 Shall we take a look at what Yamaha did to make them funnerer? 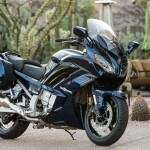 Perhaps the most frequent complaint lodged against the FJR has been its lack of a 6-speed transmission. In previous tests (here and here), both Bun-in-the-Oven Editor, Troy Siahaan, and I felt it was really a non-issue, with Troy saying about the 2013 1300A, “Despite lacking a sixth cog, even at highway speeds I never found myself searching for it.” I concurred in my review of the 2014 1300ES, wondering if ”the complaints [were] just gear envy.” Well, Yamaha felt the time had come in 2016 to do something about this longstanding issue. Since major transmission changes usually require new engine cases, we figured this would preclude the update until Yamaha decided to give the FJR a completely new engine. The engineers, however, thought otherwise. The engine cases are the same as last year’s, but inside, a new 6-speed transmission plus an assist and slipper clutch have taken up residence. The engineering magic was worked by separating the gear and the shift dog. By splitting the dog and the gear itself, enough space was saved to allow the sixth gear. 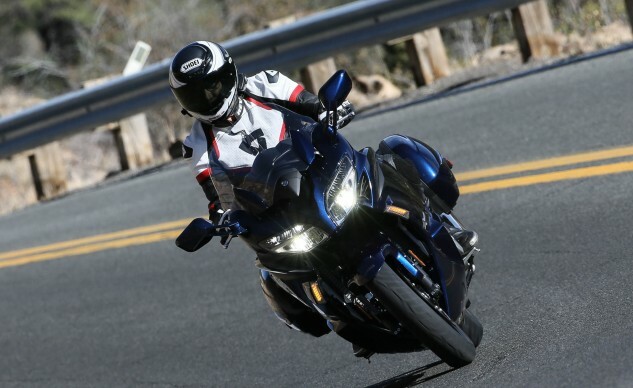 “Typically, when you add a sixth gear, you need to widen the shafts, widen the cases, [creating] all new cases, a wider motor, a heavier engine,” explained Derek Brooks, Motorcycle Product Manager, Yamaha Motors. Since a wider, heavier engine would compromise ground clearance, the path forward was obvious. Given the opportunity to rearrange the transmission’s internals, the ratios of the other gears were adjusted, too. First and second gears were made slightly taller to allow them to be carried to higher speeds. 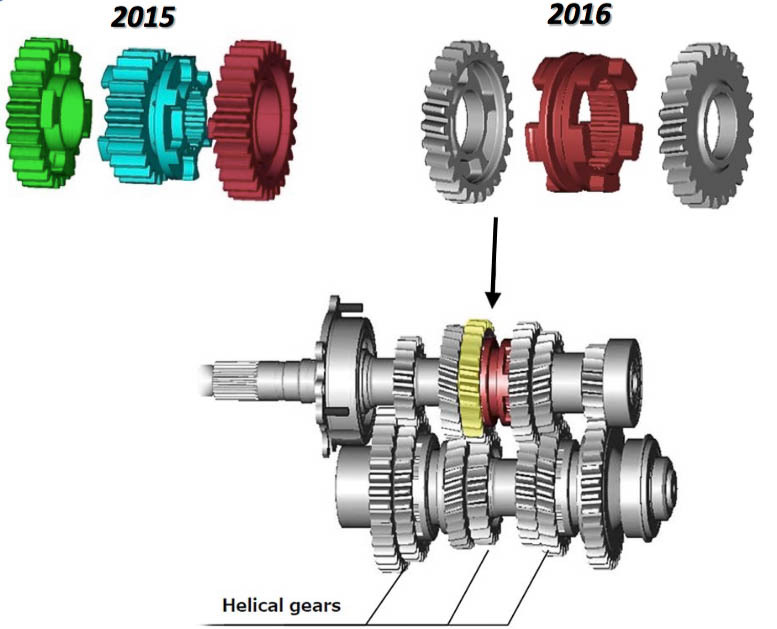 With the ratio for third gear remaining the same, fourth gear was made a bit shorter to lessen the gap to third. 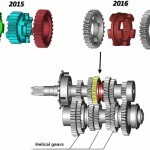 Fifth gear, since it is no longer the top gear, was shortened even more to give a smaller gap between it and the newly shortened fourth gear. 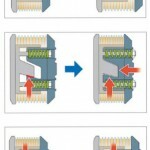 Essentially, from second to fifth gears, the spacing between the ratios was tightened. Finally, the new sixth gear is significantly taller than the old fifth gear ratio, yielding an approximately 10% reduction in engine speed which translates into roughly 500 rpm less at highway cruising speeds. Separating the dog from the gear freed up enough room to insert the extra gear into the same engine cases. 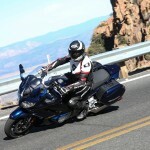 The practical result of the new ratios is the requirement of slightly more throttle to launch the FJR. Since torque is plentiful, this poses no real problem. The lessening of the gap between the gears translated into a smaller rpm drop with each shift for snappier acceleration. Finally, in sixth gear, the tach settles in at a relaxed 3,500 rpm at 70 mph – an ideal location for transport down the interstate. In twistier confines, the lower fifth gear offered a good compromise of responsiveness versus engine speed. Of course, when the pavement really begins to undulate, choosing lower gears makes for more aggressive acceleration out of corners and more easily controlled deceleration from engine braking. 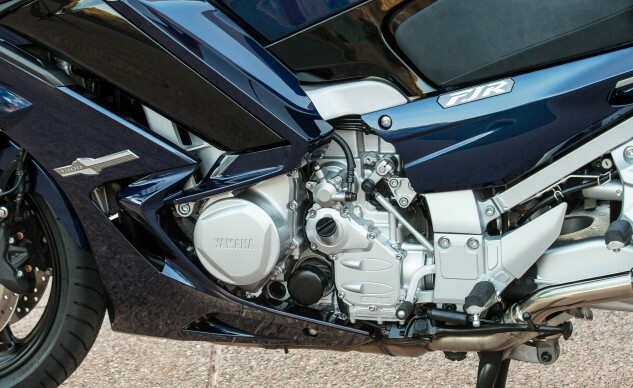 Here, too, Yamaha’s new transmission shone; the new helical-cut gears made for slicker shifting with more positive engagement. Additionally, another nice benefit was a decrease in driveline lash which links the rider’s wrist even more directly with the rear wheel. 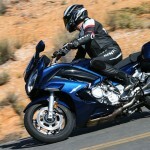 Finally, touring riders will appreciate that the transmission is now quieter than it was previously. All of these changes stem from the decision to add an additional cog to the gearbox, turning what may only be one line on a feature list into a big change in the riding experience – even for those of us who didn’t think the sixth gear was needed in the first place! 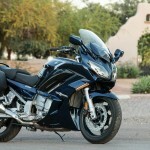 The silver fork sliders show this to be the FJR1300A. The assist and slipper clutch engaged (top left) and released (top right). The forces created by acceleration force the plates together more tightly (middle). 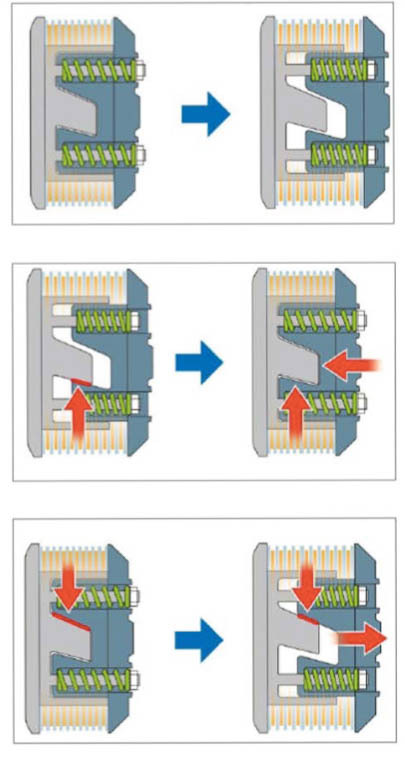 Reverse torque from abrupt deceleration causes the clutch plates to release, allowing beneficial slippage (bottom). We’re still not done talking about the drivetrain. 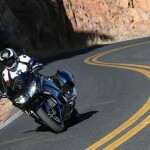 Yamaha also added an Assist and Slipper Clutch to the mix. The benefits of this clutch setup are that, in the assist portion, the clutch basket/pressure plate are shaped so that the drive forces actually clamp the clutch plates together, assuring a firm, slip-free delivery of power. 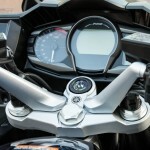 The upshot for the rider – and the reason Yamaha used it – is that lighter clutch springs can be used, thus reducing lever effort for the rider. 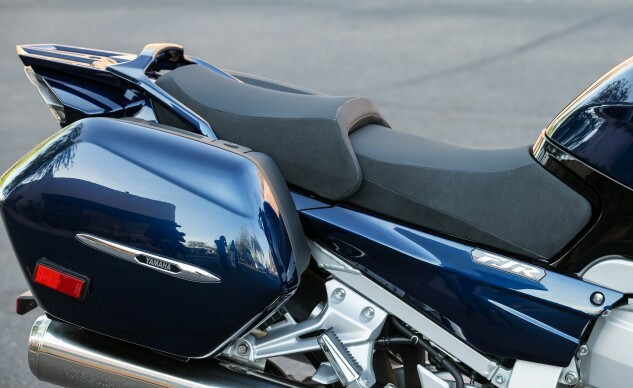 (You can see it on several current bikes, including the 2016 Triumph Street Twin and the 2015 Harley-Davidson CVO Street Glide, among others.) 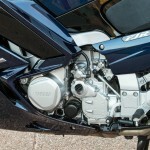 In the case of the FJR, the sturdy diaphragm spring was replaced by three coiled ones of a lower strength. 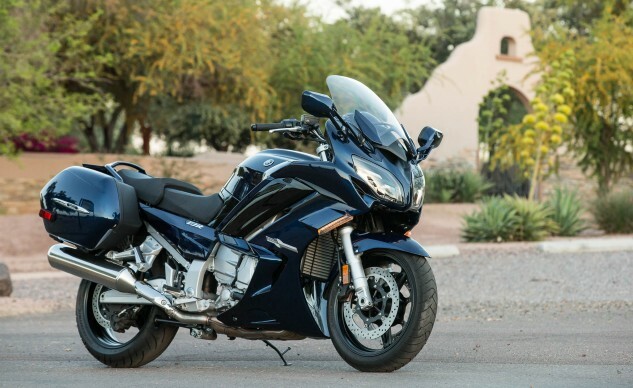 Riding in traffic and maneuvering around parking lots is appreciably easier on the left hand – an improvement I didn’t feel the FJR needed but, again, was impressed with, nonetheless. On the slip side of the equation, the same structure that locks the plates down on acceleration causes the plates to loosen on reverse-torque, such as a botched downshift. I can attest to the FJR’s ability to allow the clutch to slip instead of getting the rear wheel hopping from an instance where I approached a tight, second-gear corner only to realize at the turn-in point that the radius decreased sharply just ahead. In the rush to get the shift in at the same time I was initiating my turn, I delivered a pretty ham-fisted clutch release. Instead of a hop or a slide that could’ve caused the rear tire to step out, the rear contact patch betrayed my mismanagement with only the slightest chirp before rolling. All of these changes were made to an engine that already pumped out, when tested on the MotoGP Werks dyno in 2014, 88.7 lb-ft of torque and 127.2 hp. 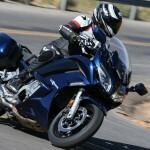 Doling out over 60 lb-ft at just 2,000 rpm, the FJR’s 1298cc has a reputation for smooth, lurch-free power delivery. The annual changes in EFI maps and the reduction of driveline lash have even minimized the occasional abruptness in first gear at low speeds. 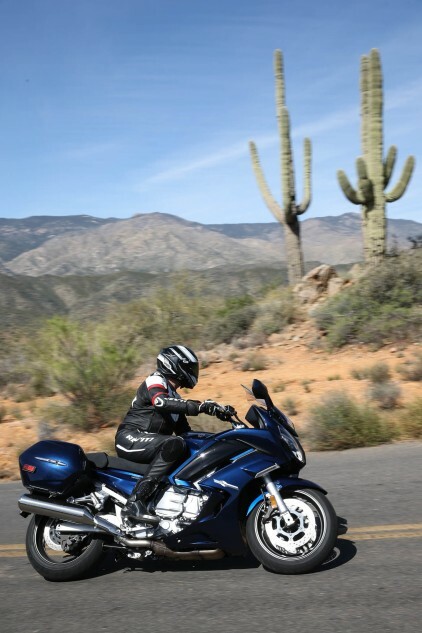 The shift-on-the-fly power modes soften the power delivery in Touring while still producing the same peak power as Sport mode. Also controlled from the grips are the windshield height, cruise control, heated grips, and the suspension settings (on the ES). 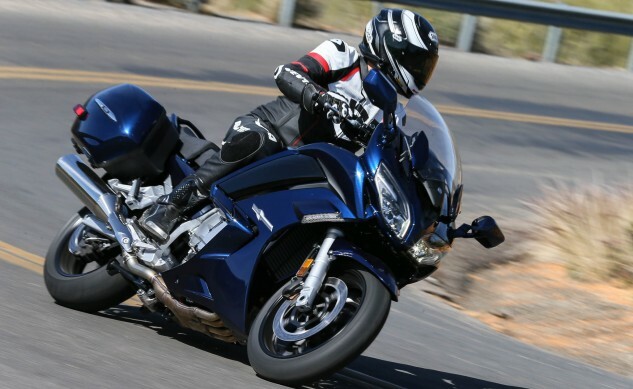 For 2016, the FJR1300A includes an updated suspension. Although it still foregoes the inverted fork of the ES, the A’s standard 48mm fork is now manufactured by KYB instead of Yamaha’s internal suspension manufacturer (YHSJ). The fully adjustable fork and the preload/rebound-adjustable shock both feature revised damping designed to give them a similar character to that of the ES. With the shock’s Hard/Soft hand lever in the hard position, the ride of the A is very similar to the ES when in firm mode. For attacking a serpentine road, the A’s suspension works as good as the ES’s, but I’d still like both to be a little firmer, allowing less front-end dive under braking. That said, the A’s suspension is a good compromise for a bike that will be ridden on both the interstate and winding roads. 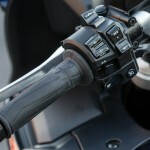 The ES allows a more comfortable freeway drone at the toggle of a thumb switch, though. The other feature that the ES receives but the A does not is the new Cornering LED Headlight technology. 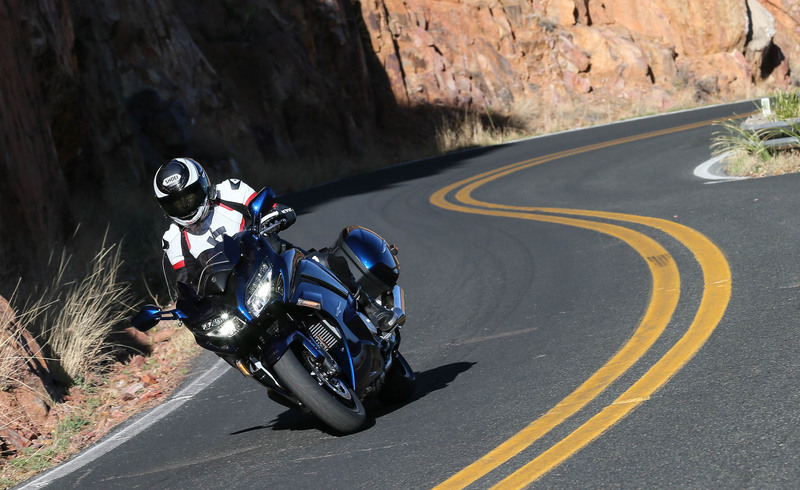 Utilizing the same six-axis IMU (Inertial Measurement Unit) as the R1, the FJR1300ES tracks the lean angle and, in three stages from 7°–16° at speeds above 3 mpg, illuminates three LED just above the inside headlight. 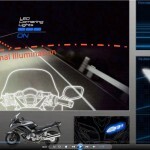 In practice, the cornering LEDs’ effectiveness is a mixed bag. When the bike is on the outside of the corner (as in a left turn or the furthest lane from the inside of a right turn in a multi-lane divided highway), the LEDs have a long enough throw to illuminate a usable portion of the road. In a righthand turn on a rural, two-lane road, the LEDs illuminate only what is immediately to the right of the bike. 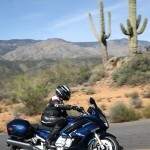 If that happens to be lightly colored bushes or a stone mountainside, the amount of light reflected back at the rider actually makes it harder to see ahead, by effectively increasing the lighting contrast between the foreground and the darker distance. The startup test cycle shows how the LEDs light in series as the FJR leans over through the 7°-16° range. To be fully effective, the LEDs need to be aimed more forward, but I suspect that they might then run afoul of headlight directional regulations and/or shine in the eyes of oncoming drivers. Where I found the cornering LEDs to be most effective was in 90° turns in suburban settings. 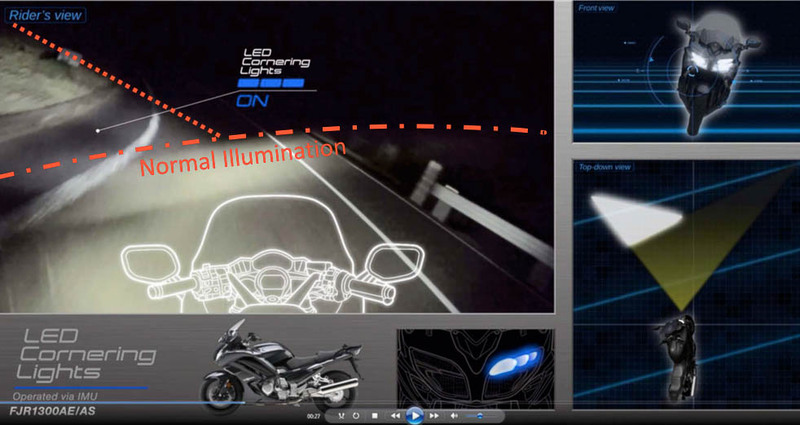 As soon as the bike moved away from a stop and a turn was initiated, the first of the LEDs would come on and show the road surface in the direction the bike was turning while the headlights were still pointing straight ahead. This makes it possible to see and avoid objects in the road you’re turning on to. The LED cornering lights provide extra illumination in specific situations. 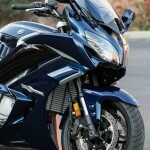 Yamaha’s switch to all-LED lighting for the FJR is for both stylistic and practical reasons. Having the brake light and turn signals powered by LEDs allows for styling choices that add a touch of modernity to an older design. Functionally, the headlights are a huge success. Since both the 1300A and 1300ES receive the LED headlights, buyers who want to save a little won’t miss out. As is often the case with LED lighting systems, the low-beam cut-off is quite pronounced with none of the spill usually associated with halogen lighting. So, the rider is quite aware of what is and is not in the headlight’s direct beam. The high beams are exceptionally crisp and bright, with a throw pattern that renders the cornering LEDs unnecessary. 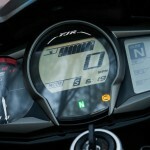 The redesigned instrument cluster, with its large speedometer, is much easier to read. Finally, the instrument cluster of both FJRs benefitted from a little renovation. 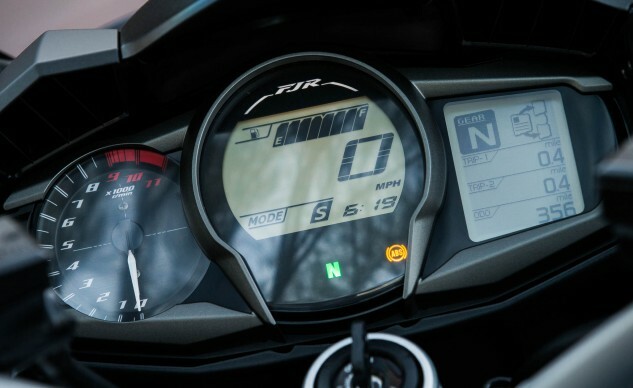 The center LCD screen features the speedometer, fuel gauge, clock and ride mode prominently enough to be read at a glance. The analog tachometer has been updated for ease of use. Both the center and right LCD panels had their background coloring changed to gunmetal gray and utilize an anti-reflective coating, making them easier to read in direct sunlight. 6-speed transmission and assist & slipper clutch! 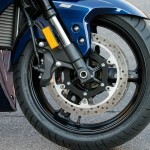 If you’re wondering why the FJR’s brakes haven’t been discussed, the answer is simple. The brakes are completely unchanged for 2016. The lever powers three pairs of pistons on the two front calipers while the pedal powers the entire rear caliper and one pair of the front calipers’ pistons. The unified ABS balances the application of the front brake from the pedal, ramping it up as the pressure increases, while the rear caliper’s pressure is directly proportional to the pedal input. Of course, the front calipers have ABS, too. 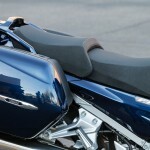 The bags are standard equipment as is the height adjustable seat. 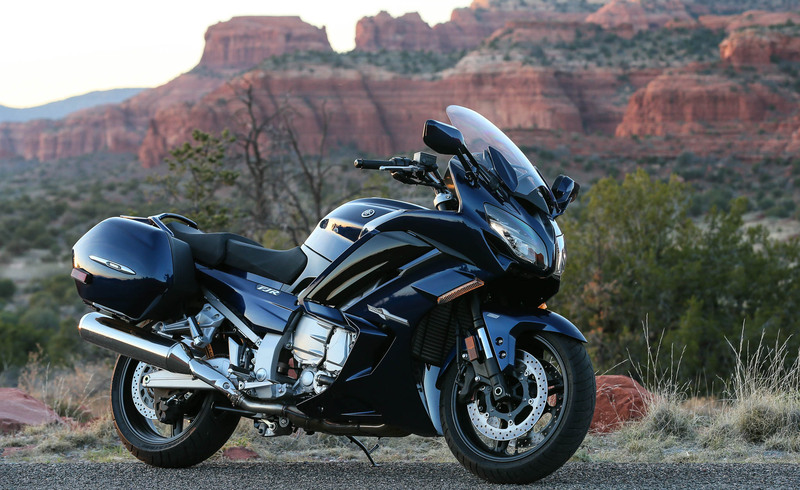 The 2016 FJR1300ES carries a MSRP of $17,990 while the FJR1300A settles in at $16,390. What you get for the additional $1,600 is the electronically adjustable suspension and the Cornering LED headlights. Whether that price differential is worth it, only the buyer can decide. However, both 2016 FJRs gained the fantastic new 6-speed transmission and an assist-slipper clutch. Those alone should spark interest in potential FJR buyers who’ve been sitting on the fence. Add in LED lighting with spectacular headlights, and what may have initially looked like a slightly warmed-over 2015 FJR – when viewed solely through the spec sheet – becomes an attractive update to an established platform. 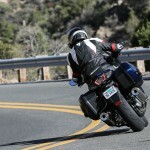 The FJR proves to be a versatile and fun motorcycle most sport-touring riders would be quite happy to own. Engine Type Liquid-cooled DOHC inline Four; 4 valves/cyl.